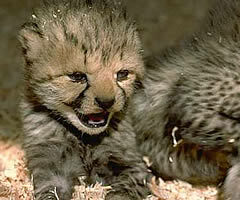 Following up on a post from a few days ago, here are some picturtes of baby cheetahs. Here is a link to an interesting discussion concerning predation on cubs (from lions and hyenas) vs. habitat destruction and genetic issues. 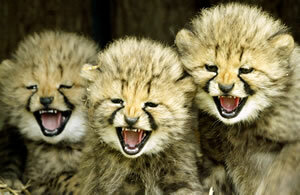 George Bush and Poison and Cheetahs, Oh My! Okay, one normal post today, because I couldn’t resist. May’s National Geographic has a story entitled “Poison: 12 Toxic Tales”. In tale twelve we find the following “The Japanese emperor hasn’t used a food taster in years, though President George W. Bush has used Navy mess specialists to handle the job. (emphasis mine)” WTF? The President uses food tasters to check his food for poison? Is it me or is this just a little bit paranoid. You’d think they’ed vet the kitchen help…but maybe not.